New NIGP survey reflects continuing market evolution since 2010. Two years after NIGP’s last survey on procurement of energy, a new survey now measures changes in policy, practice and strategy. Some results are expected, but other findings are surprising. In November 2010, the initial survey was issued by NIGP to more than 2,000 recipients. The survey was designed to gain a better understanding of how governmental entities approach the procurement of energy. In particular, the survey was intended to help better understand existing opportunities for competitive supply of energy commodities, and to gain a deeper insight into existing policies, procedures, and attitudes toward the procurement of electricity, natural gas, and transportation fuel. In general, the findings two years ago indicated a lack of knowledge regarding opportunities existing at the time for competitive procurement of electricity and natural gas. In addition, there was no widespread use of detailed market intelligence incorporated into the procurement process, and most entities started their plans just shortly before current energy contracts were expiring, thereby limiting their ability to follow the market and time their procurements more effectively. The use of professional consultants to assist with energy management and procurement was starting to become more prevalent as well. What a difference two years can make. Following is a summary of how the landscape has changed among governmental entities with regards to energy procurement. Procuring competitive supply of energy is primarily dependent upon the state laws and statues in place. There have been no significant changes over the last two years with regards to laws in place among the states allowing for the competitive procurement of electricity or natural gas. In the 2010 survey, it appeared many respondents were unaware of opportunities to source third party supply. The spread was wide enough to indicate a definite gap in knowledge of opportunities available for local governments to competitively procure power in their area. The 2012 survey indicates a positive development regarding the understanding of electricity deregulation and opportunities: Most respondents indicated correctly when asked whether their area was in fact deregulated. However, natural gas continues to be an area of confusion, and many respondents are still not aware that there are even more competitive suppliers of natural gas today than two years ago. The lack of knowledge is a lost opportunity to achieve savings over the standard gas utility rate many entities are still on. 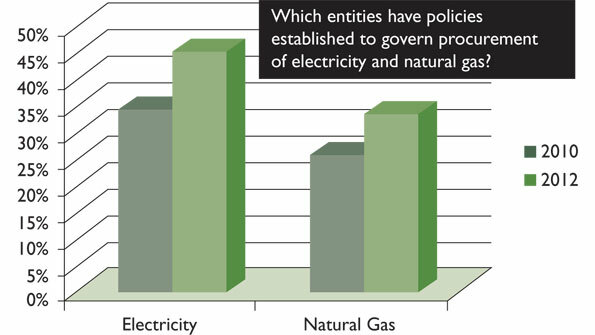 This knowledge gap regarding opportunities combined with confusing state statutes led to a lack in uniform policies and procedures utilized for the procurement of energy seen in the 2010 survey. The good news is that over the last two years, there has been a definite increase in policies established to procure energy (see Graph 1). In the case of electricity procurement, there has been an 11 percent increase in entities that have now crafted a policy. With regards to natural gas, there has been a 7 percent increase. So in general, more entities are putting structure around the process they utilize to procure electricity and natural gas. There were no significant changes measured from 2010 to 2012 regarding how these policies match up to existing state statutes and regulations governing the procurement of energy (or the lack thereof). In most cases, still about 75 percent of the respondents indicate their policies either comply with state statutes, or that they are not in conflict.